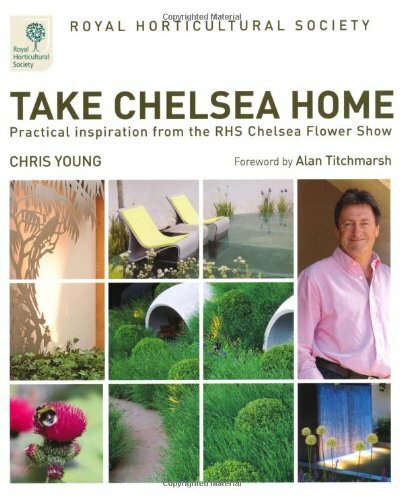 ‘Take Chelsea Home’ by Chris Young shows the “Best Garden Design from the Chelsea Flower Show”. Below is a brief preview of the 2010 gardens and designers. Tom Stuart-Smith; The Laurent-Perrier a champagne of gardens featuring a woodland of birches. Roger Platts; The M&G garden roses for the main sponsor. Sue Hayward; The Stephen Hawkins MND garden with unusual plants. Pual Stone; Place of Change a large community design. Leeds City Council; Hesco garden trying to pretend Leeds is a tourist destination. James Wong; Malaysia tourism garden, now here is a tourist destination. Robert Myers; Cancer Research garden, charities normally perform well at Chelsea. James Towillis; The L’Occitane garden a landscape of Provence. Thomas Hoblyn; F&C Investments garden that should grow better than the investments.